Cal Aero Events is a unique event venue in Southern California . 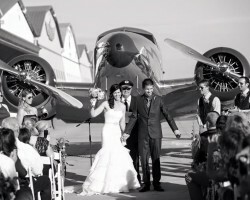 The Cal Aero Aviation Country Club is a 5 , 000 square foot hangar with vintage aviation architecture and d é cor that is perfect for any type event . Wedding Events and Receptions - Our unique wedding venue provides a setting with a stunning backdrop for your special day ! Contact us for a free quote or to book a tour . Cal Aero Events is a family - run venue who prides themselves in putting on flawless events .